Someone recently asked me what I’ve been feeding the twins since they started on solids. The questions was one which arose out of curiousity more than an enquiry on why my twins look so…solid! *lol* They aren’t much bigger than the average 7+ month old baby really. When I came to accept the fact that I wasn’t going to be able to breastfeed my children successfully, I decided that I would do my best to ensure that they get the best, most nutritious food that my purse-strings would allow. I’m delighted to report that I have from the get-go tried to do this and continue to try and feed my children well. I’ve been following the Super Baby Food Diet book which my sis-in-law kinda recommended. She was reading it but didn’t make an outright recommendation. I got a copy for myself and have been following this diet quite zealously. 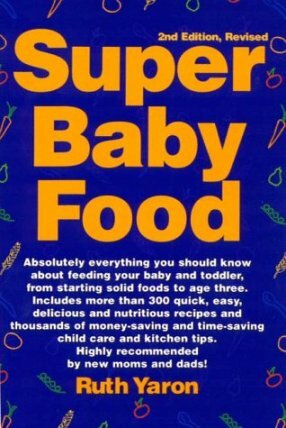 I don’t know if this is the best book about baby foods, but I found it simple. I like that she tells you when is the best time to introduce what sorts of foods, e.g. Sweet Potatoes and Avocados at 6 months, Carrots, Peas, etc at 8 months. For a new mommie like me, information like this really helps. I don’t second guess my choices on how to feed them and what’s the best ways to cook their food. 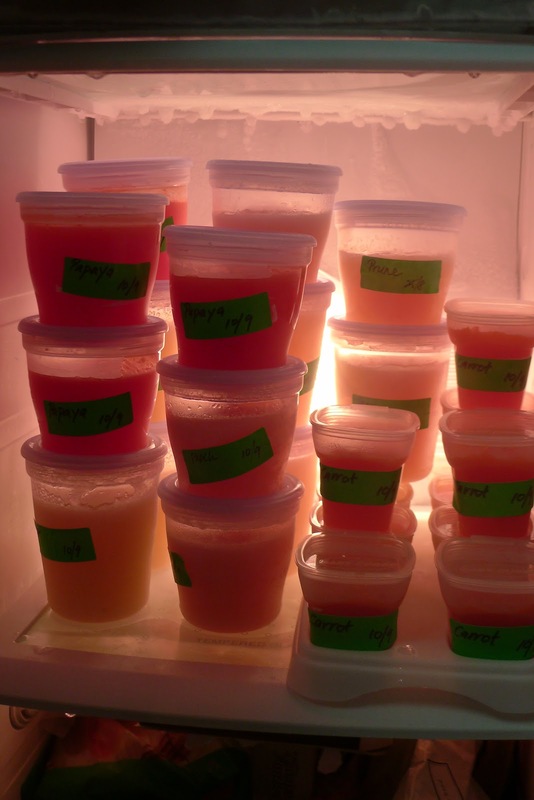 So I steam and puree different types of foods for the twins which I store in the freezer. I do this about once a week. Right now we’re still in the midst of introducing new foods, but they eat a staple of a daily porridge made out of brown rice, oatmeal, barley with a sprinkle of ground flax-seed. This porridge is mixed with usually a fruit for the mornings, and sometimes served with yoghurt. And a vegetable for supper. We’re going to work towards introducing more legumes for their base porridge, and more veges so that they end up eating a mix of veges during the day. They are such great eaters the two of them, and would even wallop sour prune puree which even my mom can’t swallow. LOL! I actually enjoy prepping their food for them, the peeling, cutting, steaming, pureeing, labelling are all very therapeutic activities. It also makes me feel wonderful that they’re eating good wholesome foods. So far, they’ve started eating: Brown Rice, Oatmeal, Barley, Yoghurt, Peaches, Prunes, Pears, Bananas, Avocados, Peas, Carrots, Asparagus, Sweet Potatoes and Tofu. We still have a long list of foods to introduce and I aim to try and introduce as much as possible. I want my babies to have a varied palate for different cuisines, even from a young age! very good. i can steal their food. muahahahha. You are doing SUCH a good job. Just look at that freezer! p.s – just recommended this book to my cousin, Sam, who is weaning her little Roxy 🙂 I checked out the site, there are also some great recipes for toddlers that look pretty damn tasty. Fangirl: Thanks much! Will try and add Sam so that we can swop mommy battle wound stories! You are my inspiration. Willa eating brocolli with blue cheese shaped my worldview about children and food! Hello Iva its Hamid rana, from lahore, Pakistan, remember? How r u? and whats going on! Next Next post: the tooth fairy MONSTER!